What does the A in ABM really mean? Accounts or anyone? I’ve had some really interesting chats with a few people this week mostly around what the ABM means to them and it raised an interesting point in my head. What does the A in ABM actually stand for? It seems that there is a huge disparity between what ABM actually means. If you look at Demandbase then you’ll see “ABM” talked about in an en masse context, whereas elsewhere, you’ll hear ABM described as a 1:1 situation. 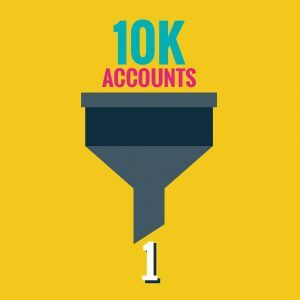 We’ve been working with lots of clients on ABM programs and again, there seems to be a big chasm; some clients give us a list of 10K accounts, others give us 25, and the programs have to be completely different for either scenario. I was actually having a chat with someone who works at a very large enterprise organisation about this exact subject the other day and she raised a point which helped to make more sense of this. Account Based Marketing is usually focused on Enterprise organisations. In EMEA, there aren’t a huge number of these and so whilst we’ve been running ABM programs for a long time, most of these have been using very direct tactics such as EDM, events and DM where applicable. What’s changed is the evolution of tech solutions, giving us the ability to target digital programs at companies. However, most organisations in EMEA are HQ’d in the US and in the US they have lots of enterprise-sized organisations, so ABM hasn’t been such a widely adopted discipline over there. It means that clever organisations such as Demandbase, Bombora, Terminus have created ABM solutions for US marketers to start to really build and target their prospect list. That prospect list is usually pretty large and so when this made its way over to our sunny shores, some of us are sceptical of these techniques whilst others look at it as an opportunity to start to build granularity into their targeting. This brings me back to the original point. What does the A in ABM actually mean? The purists amongst us would say it means 1:1 accounts and the marketers that need to spread the net a bit wider would say 10K. Which one is it? As an agency, I don’t think either is wrong. It’s still account based marketing, but when it’s 1:1 it’s much more personal and when it’s a large list it’s much less so. But here’s the thing, with a large list of prospects, you can start with as personalised an approach as possible, refine your audiences down and start to build more 1:1 conversations. My personal view is that 1:1 marketing should happen when an account is signalling that it is engaged (whether that comes from sales or marketing). Up until then, you need to cast a slightly wider net (whether that is 50 or 10K) and narrow them down so you are able to have those 1:1 conversations. We’ve been into organisations where they do the 1:1 really well, but they rely on sales completely to tell them who those organisations should be. In other organisations, mass marketing is done really well but there’s no 1:1 at all and so the customer journey is broken. With ABM, en masse marketing can help sales with the companies they should be targeting and then marketing can focus on individual account level marketing programs and work on conversion. So, what am I saying the A in ABM should be – accounts or anyone? Both, if you can market to a list of companies. Be it 10 or 10,000, you should be focusing on driving the volume to become focused and targeted so you can build in those hyper-targeted 1:1 engagement programs.